As I mentioned a few weeks ago, it’s been three years since I joined the Eclipse Foundation. This is the first installment in a series of blog posts on the past, present and future of the Eclipse Foundation that I plan to write. Out of curiosity I decided to go back at take a look at the presentation  that I gave to the Eclipse Board of Directors at the time. As part of their recruitment process, they wanted each candidate to give a brief talk to outline their interest, agenda and qualifications. I was actually rather surprised how well the talk has withstood the test of time. Most of the goals and priorities I talked about three years ago seem to be relevant even three years later. I thought it would be interesting to review a couple of highlights and point out a few things that I got right, and a couple of boners as well. Please let me know what you think. 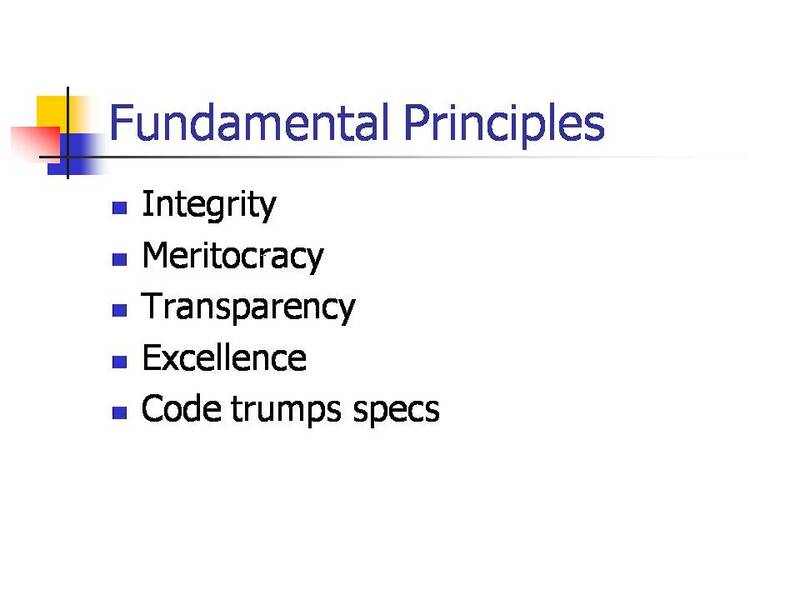 And remember: the points in this presentation were made over three years ago, before I even started working at Eclipse. When you’re looking at the slides, remember to do the Time Warp. 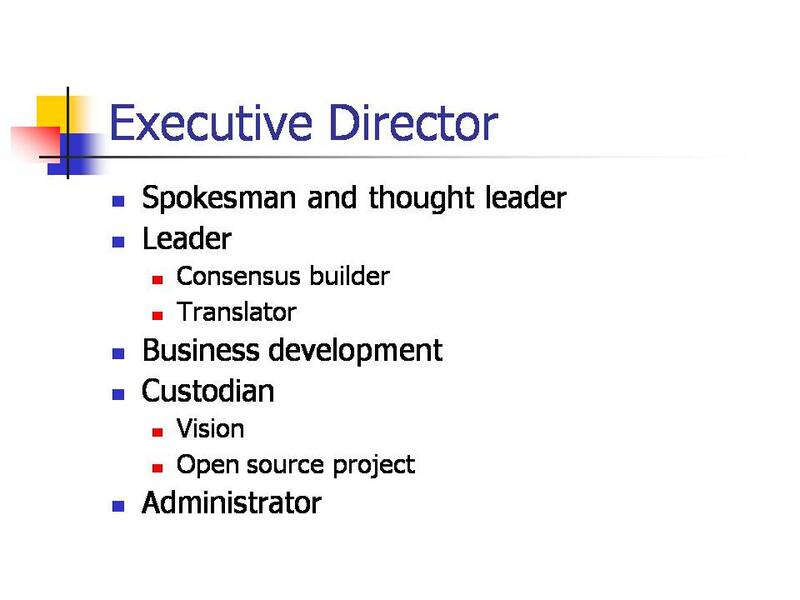 Towards the end of the presentation I had two slides on what I thought the role of the Executive Director would be, and what values the incumbent would have to bring to the job. I honestly believe they’ve held the test of time, and I will leave it to the readers to tell me how they think I’ve done in meeting those over the past three years. I should mention that what I described as “Business Development” at the time I would now refer to as “Ecosystem Development”. E.g. It is a very large part of the Executive Director’s job to try to drive value and commercial opportunity to the member companies of Eclipse. “Eclipse Today” (e.g. 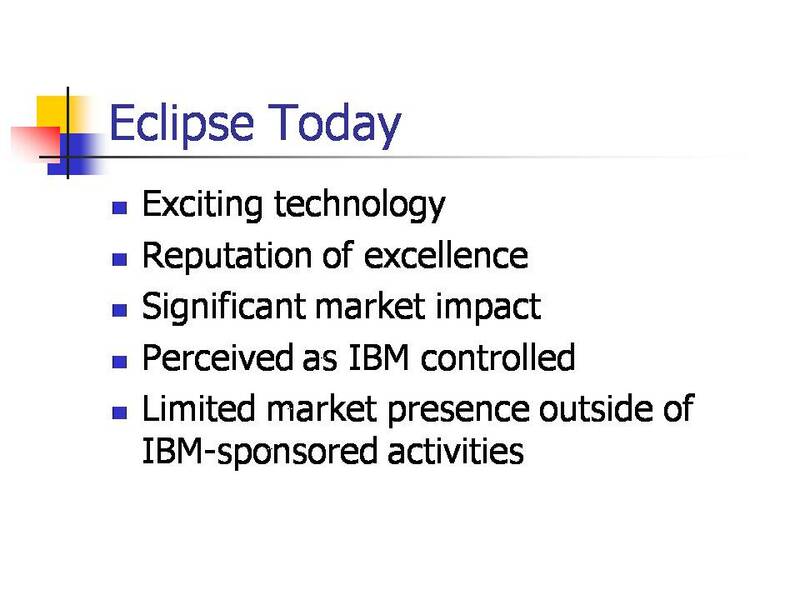 Eclipse in 2004): I still think that these points were pretty much spot-on. The most relevant ones were the points about being perceived as IBM controlled and limited marketing presence outside of IBM activities. Later under Short-term Priorities, I mentioned a goal to ““Re-brand” as an independent entity”. To a large degree, that was a very large part of what we accomplished in 2004, leading to the rapid expansion in strategic membership in 2005. Establishing Eclipse as an independent entity took some time and effort. The tipping point was EclipseCon 2005 when BEA, Borland, CA, Sybase and Wind River all joined as strategic developer members. There were a few times where I made the point that the the health and vitality of the Eclipse open source project(s) is absolutely key. Although Eclipse is in many ways a trade association or consortium, the source of all value is what happens in the projects. The perfect scenario is where we see a virtuous cycle of growth and investment between the projects and the ecosystem. I believe we’ve made a lot of progress in establishing that. We’ve certainly seen a large growth in the number of organizations contributing code, projects and committers at Eclipse. Of course growing the ecosystem was and is an important goal. Our membership has grown to well over 150 companies. Five have joined so far this month! Growth in membership is an indicator of the health of the overall ecosystem. But probably even more important is the huge number of products now built on top of Eclipse, with more coming all the time. 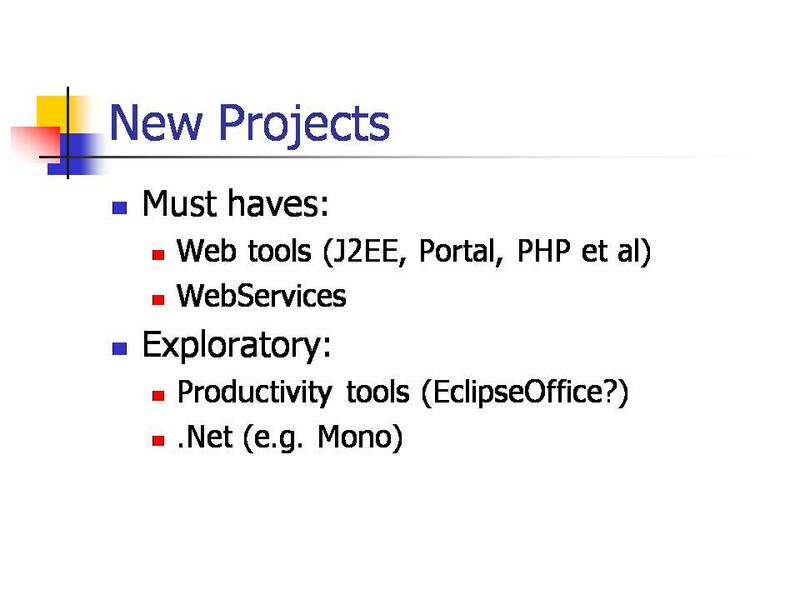 I was mostly wrong when thinking about what I termed as “exploratory” projects for Eclipse. I’ve always thought that a sign that RCP was doing well would be someone interested in driving a project to build productivity tools on top of it. Lotus Notes is the first instance of that happening that I’m aware of, and a very impressive one at that. But at the time I was thinking of an open source project and despite a few close calls that has not come to pass. Thinking that Mono would be interested in using Eclipse was, in retrospect, naive. 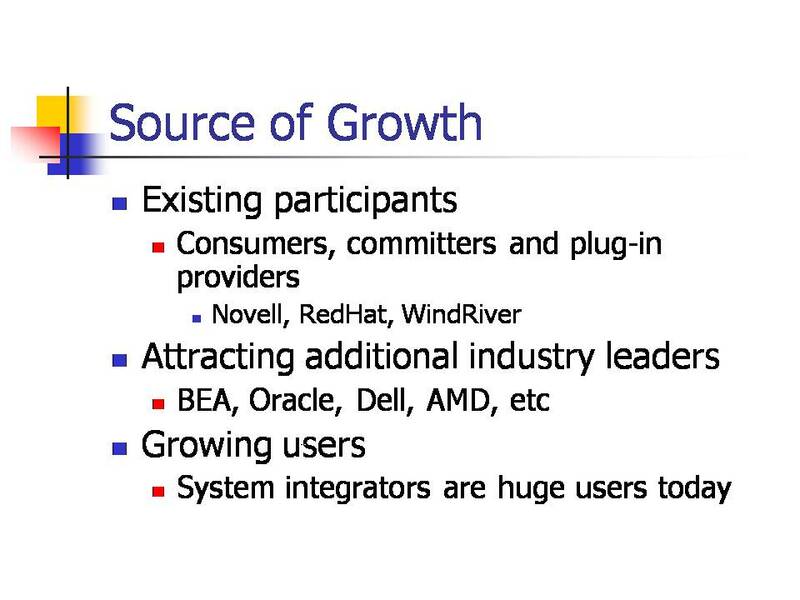 Up until now at least, I was definitely wrong proposing of system integrators as a potential source of growth. Although they use Eclipse heavily, to date we’ve been unsuccessful in engaging with them to get involved in Eclipse as either members or contributors. In the interest of full disclosure, I should mention that I made a few edits to the original presentation. I added “March 2004” to the first slide. I deleted several references to personnel decisions in the interest of privacy. And I deleted one slide which referenced confidential information. Everything else is as it was. Hi Mike. Why wouldn’t Mono be interested in developing a C# IDE plugin for the Eclipse platform?